This is absolutely crazy. This is a deck entirely built around Channel, and at first glance, it’s not at all obvious what’s going on. 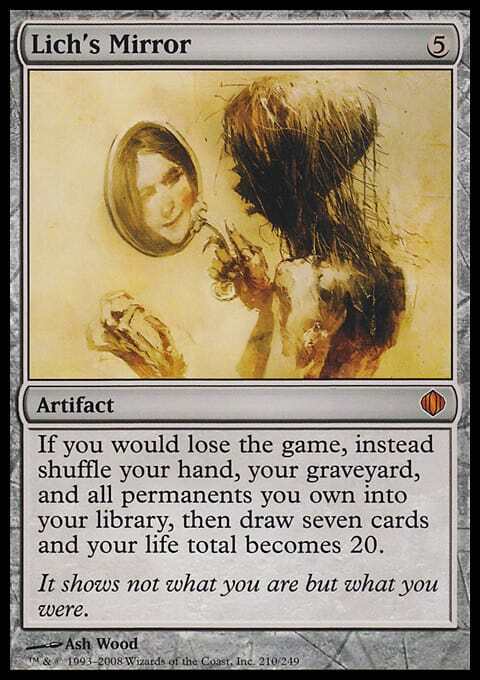 The crux of the combo is the interaction between Channel and Lich's Mirror. Channel gives you a pseudo-emblem for a turn, allowing you to pay life to generate colorless mana. That colorless mana can be used to cast Lich's Mirror and then you can freely pay all of your life and use the replacement effect on Lich's Mirror. Your channel is still active, but now you’ve drawn seven cards and gained twenty new life, all of which can still be spent on Channel. Between Lich's Mirror, Memory Jar, and Planar Bridge fetching both of those cards, you can continuously loop through your deck, activiating Lich's Mirror after Lich's Mirror. Each iteration will net you some amount of mana, and eventually you can find a combination of Pact of Negation and win conditions that allows you to actually kill your opponent without fear. This deck opts to play Fireball as the win condition for style points, but it is more than reasonable to play something like Walking Ballista or some other colorless spell or combination that does not require you to stretch the mana. All in all, this is a really exciting combo deck, but it is enormously fragile. If your Channel gets Duressed or countered, you’re kind of out of luck. Yawgmoth's Will is sort of an out, but you have to be careful about which cards you allow to get exiled in case you might need them shuffled into your deck. There’s a lot of room for interesting changes to this deck, ranging from Spirit Guides and what kind of interaction you can afford to play to the actual win condition. It’s a really cool combo deck that I hope we see more iterations on.